Whether its your first or 15th sailing, its easy to choose the perfect cruise. Its just a matter of figuring out exactly what you want and then finding the line, the ship, and the itinerary that best provide it. Quite simply, theres never been a better time to cruise. With more than 85 new ships hitting the high seas during the building boom from 2000 to the end of 2007, theres a cruise for practically anyone. Now ships of every size feature amenities cruisers would have never thought possible back in the days of pleasure cruising, when pioneering lines like Carnival launched its first ship in 1972. Carnival Corporation is now the largest cruise vacation group in the world, with 10 cruise brands that include Carnival, Holland America, Princess, Seabourn, AIDA, Costa, Cunard, Ocean Village, P&O Cruises, and P&O Cruises Australia. Together, these lines offer more than 75 unique ships, with more than a dozen new ships scheduled for delivery between by 2011. Whether world-class spas and celebrity chef cuisine or ice skating rinks, climbing walls, and surf simulators--and maybe even a cruise to Antarctica--choosing the right cruise is easier than ever, especially if you know who to ask. One key to choosing the perfect cruise is getting experienced advice. Over the years, AAAs name has become just as synonymous with travel services as with emergency road services. Thats thanks to AAA Travel agents who can help you pick the perfect line, ship, and itinerary. Though theres obviously overlap between lines, each cruise company generally has certain tendencies when it comes to the age and interests of typical passengers, special emphases, pricing, and other ways to attract certain types of cruisers. Though every line or ship isnt right for everyone, finding the ideal line and ship for most itineraries is relatively easy. In the value category, cruise industry pioneer Carnival is joined by the likes of Norwegian Cruise Line (NCL), Royal Caribbean, Windjammer, and Costa in offering the best bang for your cruise buck. Carnivals Fun Ship cruising crowd tends to be younger, but the lines demographics are changing as its many repeat passengers age and are looking for more focuses on food, wine, soft adventure, and in-cabin amenities. Recently, Carnivals $250 million Evolutions of Fun refurbishment program upgraded all eight Fantasy-class ships, and the lines foray into Europe provides fun new ships and destinations. The numerous fans of NCL say the lines groundbreaking freestyle cruising initiative provides the most flexibility when it comes to dining, ship debarkation, and much more. Though the line did move the Pride of Hawaii (re-flagged the Norwegian Jade) to Europe this year, NCL is still particularly popular for Hawaiian Islands cruising. With the lines new Norwegian Gem and the Norwegian Jewel, this gives NCL its largest European deployment ever. Royal Caribbean is especially popular with the more adventurous, offering active onboard amenities like rock climbing walls and, more recently, very popular surf simulators, as well as lots of soft adventure shore excursions. Windjammer goes after the younger set in search of sailing the high seas on a low budget, while Costa offers a more traditional value-oriented cruise with an Italian flair. In many ways, Princess put cruising on the map with the 1970s TV hit, The Love Boat. Today, the line features 14 ships that cruise the globe. Weve been known to have passengers board our ships and ask, Where is Captain Stubing? says Julie Benson, director of public relations at Princess. The weekly series, which introduced millions of viewers to the concept of the cruise vacation, was an instant hit and both the company name and sea-witch logo have remained synonymous with cruisers all over the world. With three shining new ships introduced in the past two years, the line now stands at 17 ships and will add the Ruby Princess in late-2008. Also in this category, Celebrity has led the way on the food front, thanks to the industrys first celebrity chef, Michel Roux. Along with renowned service, Holland America is targeting foodies as well, thanks to the new Culinary Arts Center the line concocted with Food & Wine magazine. Its part of the lines $225 million Signature of Excellence initiative, which includes new beds, flat-screen TVs, enhancements to their private Caribbean island experience and much more. Disney is incredibly popular with families, but the line also has lots of repeat passengers who cruise without children and especially love the lines private island, Castaway Cay. In addition, Disney is returning to the west coast this year, thanks to overwhelmingly positive feedback about the lines original west coast sailings out of Los Angeles (ports of call will include Cabo San Lucas, Mazatlan, and Puerto Vallarta, as well as three days at sea aboard the Disney Magic). Swan Hellenic, MSC Cruises, Oceania, Norwegian Coastal Voyage, and Windstar all offer upscale European style and service at mid-range prices. Star Clippers attracts those who love the lines claim of offering the largest and tallest sailing vessels in the world, while small ship specialists Cruise West and Clipper both cater to a loyal following of experienced travelers who like exploring places the larger ships cant reach. Cruise West is particularly popular with AAA members heading for Alaska, but the line is also drawing lots of repeat passengers to Asia, the Northwest U.S., California wine country, Mexicos Sea of Cortez, and Central America (Costa Rica and Panama). The ultra-luxury cruise companies include the likes of Crystal, Silversea, Regent Seven Seas Cruises, Seabourn, SeaDream, and Cunard. These lines often feature extras like more spacious cabins, upgraded cabin amenities, butler service, complimentary alcoholic beverages, and practically anything else a passenger could want. 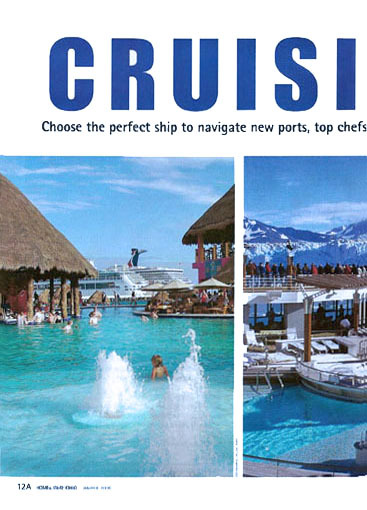 For instance, Crystal distinguishes itself with lots of space and staff per passenger, while Silversea does it with the industrys only personalized voyages (choose when and where youll embark and disembark) and the new Viking Cooking School. Regent Seven Seas ships feature all-suite accommodations, as well as select wines and spirits served throughout their ships. Seabourn and SeaDream both target the yacht-like cruise experience, with smaller ships and individual service and amenities. Last, but certainly not least, Cunards Queen Mary 2 experience is simply one of the worlds ultimate cruising opportunities (especially at the Queens Grill accommodations/dining level). The ship offers a host of innovative onboard features, with the only planetarium at sea and a Canyon Ranch spa. In addition, Cunards new Queen Victoria is setting a new standard in classic ocean liner sailing, including the first floating Cunardia museum display, a two-story library, private viewing boxes in the Royal Court Theatre, and a grand colonial-style winter garden with a retractable glass roof. Cunards Queen Elizabeth 2 is currently on its farewell tour until late this year after hosting more passengers than any other cruise ship in history. Once youve chosen your line and itinerary, youve typically already narrowed it down to one ship. If not, its really just a matter of preference as to size, amenities, and availability. Of course, all of these decisions can be made easier by contacting an experienced AAA Travel Agent. Then, it wont be long till your ship is most definitely in! One of the beauties of cruise travel is that you get to see lots of places, while only unpacking once. Thanks to now-popular cruises to Antarctica, you can currently cruise to all seven continents. Those in search of warm weather and lots of outdoor activities in the sun cant go wrong with the Caribbean or the Mediterranean. Lines like Carnival, NCL, Royal Caribbean, Star Clippers, and Disney are among many great choices in the Caribbean, while Windstar, Costa, Princess, and Oceania are perennial Med favorites. Alaska continues to grow as a popular choice for both first-timers and cruise veterans. Vancouver remains a convenient port of embarkation, as well as a very popular pre- or post-cruise spot. Lots of lines now offer Alaska itineraries, with long-time favorites including Princess, Holland America, Celebrity, Cruise West, and several others. Mirroring Alaskas growth, northeast North America has become a popular and convenient choice for many, especially during the colorful fall foliage season. Varying ports of call like Sydney, Charlottetown, Halifax, Bar Harbor, Boston, Newport, and more are joined by Montreal and Quebec City to make this region a great choice for many cruisers. Holland America is especially capitalizing on interest in this region. Further afield, northern Europe has become one of the industrys fastest-growing cruising regions. Whether its sailing to the Baltics larger cities (including stunning St. Petersburg), Great Britain, or the Atlantic coast, northern Europe is now luring many cruisers. Holland America, Celebrity, Silversea, and Norwegian Coastal Voyage have some superb itineraries in this region. European river cruising is also quite hot, with companies like Uniworld Grand River Cruises offering special deals to AAA members (save an additional $125 per person for cruise of seven to 13 days and an additional $250 per person on cruises 14 days and longer). Asia, especially China, has infinite possibilities, with veteran Asia-based lines like Victoria Cruises leading the way. 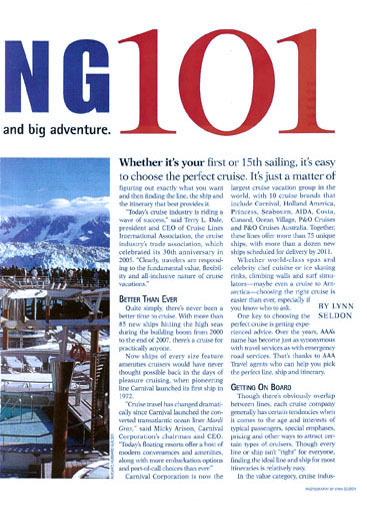 Down in Antarctica, large ships like the Marco Polo (Orient Lines) and the Nordnorge or Nordkapp (both with Norwegian Coastal Voyage), as well as smaller ships from Quark Expeditions and Lindblad, make visiting the Great White Continent almost as easy as booking a Caribbean cruise. Greenland is another hot cruise destination, with Norwegian Coastal Voyages new ship, the Fram, leading the way to new ports of call. Finally, transatlantic voyages and repositioning cruises with lots of sea days are particularly popular with veteran cruisers who simply love being on the water. For the ultimate experience along these lines, its hard to beat Cunards crossings aboard the classic Queen Elizabeth 2 or Queen Mary 2. Dining has always been a big part of the cruise experience and star chefs are now involved with cruise lines and ships in various roles, including one-time sailings and demonstrations, permanent consulting roles for all dining, and even opening a namesake specialty restaurant at sea. Whatever the role in and out of the galley, star chefs have certainly taken cruise line cuisine way above sea level. The celebrity chef scene started, appropriately enough, with Celebrity Cruises and Michel Roux back in the late-1980s. In his role as Celebritys culinary and wine consultant, Roux brought world-class dining to cruise ships. Though Rouxs long relationship ended recently, the long list of chefs and restaurateurs that followed in his tasty wake have included: Nobu Matsuhisa and Piero Selvaggio (both aboard Crystal); Charlie Palmer (Seabourn); Joachim Koerper (Silversea); Jacques Pepin (Oceania); Paolo Belloni, Cualtiero Marchesi, and Ettore Bocchia (Costa); Joachim Splichal (Windstar); Rudi Sodamin (Holland America Line); Todd English (Cunard Lines Queen Mary 2); and Georges Blanc (Carnival). Cunard Lines involvement with Todd English provides a perfect example of the evolution of star chefs since the early days of Rouxs involvement with Celebrity. Between Roux and English, many other star chefs have turned up the heat in cruise ship kitchens. The result has been a menu of star-struck options on a majority of ships. The food and personalities of these various chefs cross cultural borders, making for a cornucopia of cuisine options at sea.